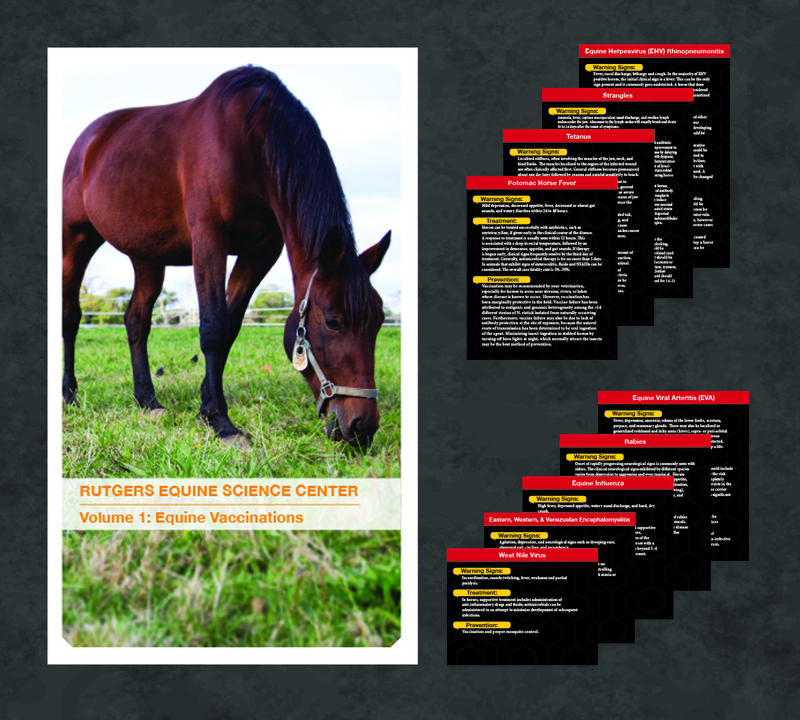 NEW BRUNSWICK, NJ (August 27, 2015) – The Equine Science Center at Rutgers University debuted part of its new education resource series “Volume 1: Equine Vaccinations” this past weekend at the New Jersey State Championship 4-H Horse Show. Giving away over 200 copies of the resource packages to every show participant, the Center aimed to reach some of the best young equine competitors and enthusiasts in the state. Debuting this to a younger demographic in New Jersey, the Center now hopes to take aim at everyone who owns or cares for a horse. This first volume covers basic information about viral and bacterial diseases; vaccination schedules; and warnings, treatments, and prevention methods for “core” and “risk-based” diseases that commonly affect horses. The resource package is based upon the recommendations of the American Association of Equine Practitioners (AAEP), and was edited by the Equine Science Center staff and Rutgers adjunct professor, Dr. Michael Fugaro. While New Jersey is quick to respond to potential outbreaks, as was the case in February when a horse was found to have been infected with equine herpesvirus and the farm was put under quarantine before it could spread any further than the infected horse, first-time owners might not realize some of the warning signs of these diseases. Without this knowledge they might not even know that their horse is infected, let alone know that they should report this to their veterinarian who would inform the Department of Agriculture. Some viral and bacterial diseases, considered “reportable diseases” in New Jersey due to their infection and/or mortality rate, must be reported in order to prevent the spreading of the disease. This is where the Center believes education will come in handy. 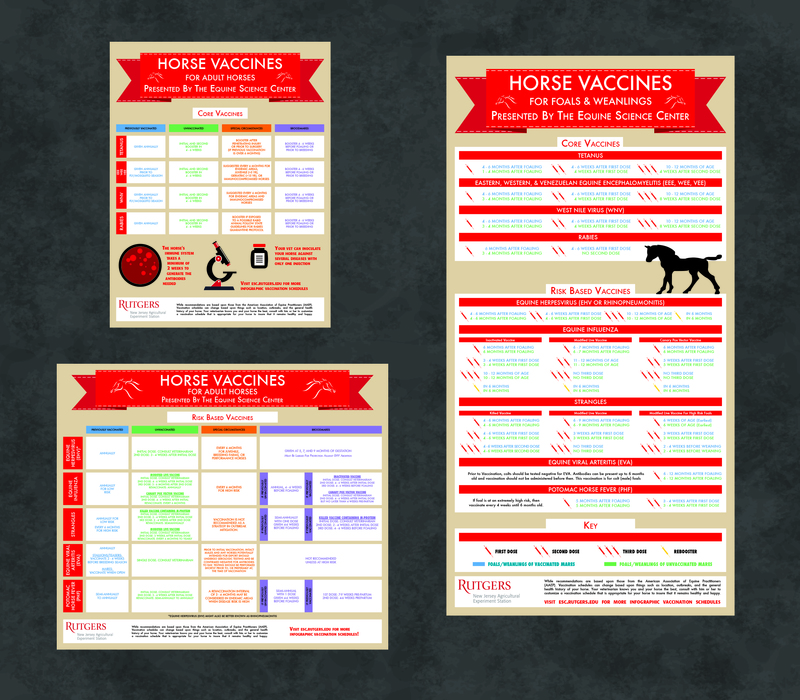 Each resource package is made up of two pull out infographics (broken into “core” and “risk based” diseases), as well as nine cards detailing each of these diseases. On each card is information about the disease on one side, and “warning signs”, “treatment”, and “prevention” on the other. While owners won’t be able to self-diagnose their horse, they will learn what to look for, and have a starting point for discussions with their veterinarian if horses start displaying symptoms. New Jersey equine veterinarian Dr. Michael Fugaro, a collaborator of the Equine Science Center, was brought on to the project to help create a package that was both scientifically accurate as well as approachable for owners of every level. New Jersey equine veterinarians are available to discuss with their clients which viral and bacterial diseases fall under this “reportable diseases” category, and create a vaccination schedule that hopefully will prevent an owner from ever having to go through that process. Often the best way to prevent these diseases is vaccination and proper bio-security measures (which the Equine Science Center is already looking at for the second volume of their resources “Volume 2: Biosecurity”). The AAEP was founded in 1954 by a group of 11 charter members who saw that together they could direct the focus of equine veterinary medicine. Today, the AAEP, headquartered in Lexington, KY., at the Kentucky Horse Park, represents an educated group of men and women who cover a broad range of equine disciplines, breeds, and associations. Nearly 10,000 veterinarians and veterinary students in 61 countries are members of the AAEP. Dr. Fugaro is a professor of equine studies at Centenary College in New Jersey, serves as an adjunct professor at Rutgers University, and as a collaborator of the Equine Science Center, and operates an equine ambulatory veterinary practice in the northeast section of New Jersey. Dr. Fugaro is board certified in large animal surgery and a member of the American College of Veterinary Surgeons. In addition, he remains active with the American Veterinary Medical Association, the American Association of Equine Practitioners, the New Jersey Veterinary Medical Association, the Pennsylvania Veterinary Medical Association, and the New Jersey Association of Equine Practitioners.